Last years Nes Classic Mini was a nice idea but it was the Snes Classic Mini that we all really wanted. Not to downplay the legacy of the Nes, and it's classic games, but Nintendo debatably hit their stride with the Super Nintendo. The extra power allowing for some of the greatest games ever to be put to cartridge. Some of my fondest memories hail from my days playing Snes games. I still have my original Snes set up, next to my PS4, and play it just as regularly... and now I have a palm sized one, in my bedroom. The machine itself looks just like a Mini-Me doppelganger of its 27 year old counterpart. (25 to those of us in the UK). Even the, thankfully regular sized, pads look and feel the same. The extra cord length (although still only about half the length of an old original pad) is much appreciated. The Nes Mini's leads were disappointingly far too short. You get two of them this time and they are also compatible with the Switch, if you own one. The flap on the front, that conceals the controller ports, is the only part of the design I have an issue with. It looks tacky when opened and I'm sure it'll snap off at some stage. On the inside, the Snes Classic Mini runs on the same R16 chip system as the Nes mini, with 256MB of DDR3 RAM. A quad ARM Cortex-A7, for system processing, and a separate ARM Mali 400 MP2 graphics processor. It uses a custom build of Linux to run emulators, coded by Nintendo, to emulate the various custom chipsets built into an original Snes and its games. You get three output display options. “CRT”, a scanline filter and a crap one, at that. “4:3”, which is closest to your old square tv screen. And finally, “Perfect Pixel”. I've been using this option the most. The whole thing is powered by USB lead and outputs using a standard HDMI cable at a max of 720p. A microwave can probably run a Snes emulator these days, so this should be more than enough for a machine over two decades old. There have been improvements made to the way the emulation handles how the screen rolls along, eliminating the ghosting and after shadow problem of the Nes Classic. Although, I have ran into a few instances of game slowdown and other oddities that don't exist with original hardware. These can be quite distracting at times. Contra 3 and Mario Kart, for example, lose their frame rate in a lot of sections that were never an issue for the original. Some extra epilepsy and seizure precautions have also be taken. Things like the strobing effect of Contra 3's grenades have been toned down considerably. The machine comes packed with 21 games, to kick you in the nostalgia. From classics such as Mario World, Mario Kart, Zelda: A Link to the Past and Donkey Kong Country to some harder to find games like Yoshi's Island and Secret of Mana. For the first time (for the UK PAL region) we get to play Earthbound and Super Mario RPG, without the need to import it; And then, for extra credit, Nintendo made an extra surprise by, adding the unreleased Star Fox 2. Which was sadly canceled, in 1995, due to the release of the N64 looming over it. Each game is still just as fun and playable as they were 20 odd years ago. In my opinion, older 16-bit games have stood the test of time better than going back and playing N64 or original PlayStation games, with a few exceptions. All the games on the Snes Classic Mini are their NTSC American versions. These run at 60hz, rather than the 50hz that the UK PAL versions did, back in the day. So we can finally play without the boarders at the top and bottom of the screen. There are still a few games that I would have liked to have been included. My all-time favorite JRPG, Chrono Trigger, would have been a much welcomed addition. As would Donkey Kong Country 2 and 3, to name just a few. With no way of adding more games, to the machine, (legally and without the risk of bricking your tiny console) and as it's emulation anyway, you could achieve the same results by building yourself a Raspberry Pi (RetroPie). Somehow that just wouldn't feel the same, to me. 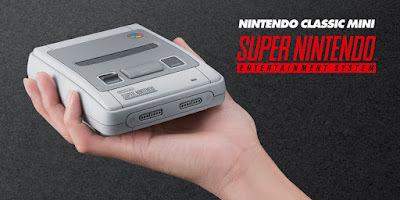 The same argument could be used that I can use something like a RetroN 5, to play my original Cartridges, but I'd still rather use my official Super Nintendo. This could just be my collector's mentality and the sense of hunting down and owning the original and official thing. It's nice to own a modern gadget that doesn't require an update every week. Looking for US Black Friday deals? Check out CeX! Congrats to our 1st Trade in to Win winner! CeX Fight Club! Thor VS The HULK!